We used Rob for our May wedding and we couldn't have been happier! It drizzled on our wedding day (which we were told was good luck) and Rob informed us that we wouldn't be able to ride with the top down. He then gave us the option to cancel on that day which we thought was quite the nicest gesture. The car is so beautiful that cancelling was an option no matter how bad it rained. We will utilize Rob and Ruby again for sure! Mr. Conrad was very professional and so easy to work with! He definitely helped easy my mind 5 days before the wedding, when I finally decided I wanted to add an especial car to our wedding day! Ruby was a great add-on for the photos + the perfect chic way to leave our church to head over to the reception!!! 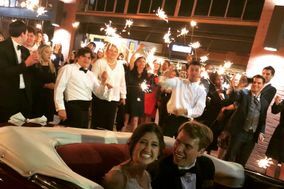 Having Ruby as our getaway car topped off our wedding night! In all honesty, we initially looked at other transportation companies around the city, but we were either too late in booking or didn't care for the vehicles they had. However, we are so glad that it worked out the way it did, because that's what brought us to Ruby! We had the top down during our drive and my husband and I both agreed that the ride from our venue to the hotel was so relaxing. Rob sparked up conversation every now and then, but always left room for us to talk amongst ourselves or just ride in silence and reminisce on the day. It was a fantastic experience and we would recommend Rob & Ruby to anyone! 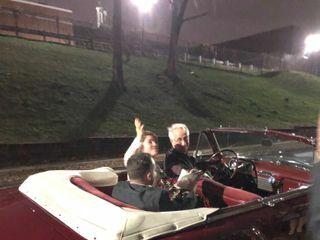 My parents surprised me with a beautiful Packard, it was the perfect get away car and wonderful touch to the end of our wedding. The driver was very nice and although we had a short drive to our hotel drove us up to Vulcan and back. Great experience. My husband and I would definitely hire Rob and his step-son any day of the week! We were searching for a wow factor for our wedding and Rob's car, "ruby", was perfect! Our guests were taking photos of the car and sometimes even in it. Rob was even wiling to drive to another location to get some gorgeous sunset shots with our photographers. If you are looking for an exceptional transportation service and a stunning car, book Rob today!